Treat your feet to this amazing foot treatment. A Hot Paraffin wax foot treatment is a great option to help with dry feet, arthritis and many other conditions. Does your skin get itchy from the dryness? Do you have sore feet due to arthritis? Are you a person that likes a little luxuries in life? A Hot Paraffin Wax Foot Treatment! 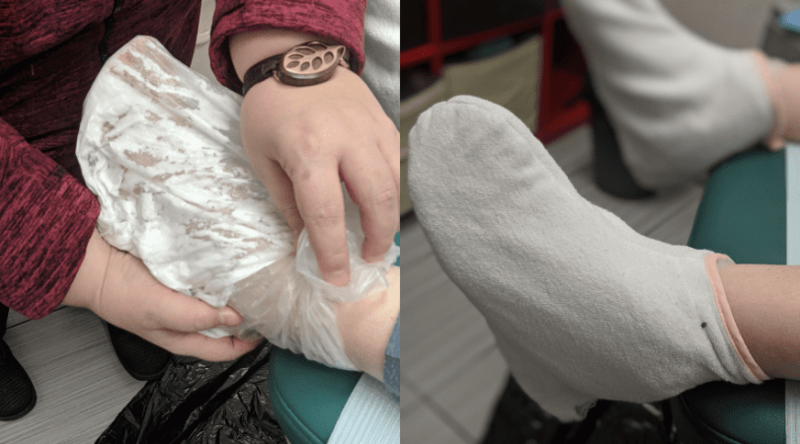 We put the hot wax in a plastic bag, manipulate it to a temperature you are able to tolerate, we massage it around your feet, wrap them in a towel and leave you relaxing while listening to music. maybe you need a little pampering! maybe you have arthritis in your feet! maybe you have sore muscles, tendons or ligaments in your feet! maybe your feet ache after a long day of being on them! maybe you have dry skin! A Hot Paraffin wax foot treatment will help make your skin softer and more youthful, it helps with arthritic pain, it helps soothe and relax muscles, it improves strength, it increases blood flow and reduces pain. And did I mention….. It feel Oooooooooh, sooooooo good!!!! !